Don’t Call Me Dave is fed up again! Most readers probably realised as much with his last blogpost. Reporting the truth is tiresome. As all of Barnet’s responsible bloggers will testify, it takes an enormous amount of time and effort to research and report the news accurately. Although DCMD enjoys blogging (with both hands), he is very busy with his work and studies (and occasionally trying to have a life) and simply finds it too difficult to find enough time to write the type of articles which used to attract 500+ readers per day. 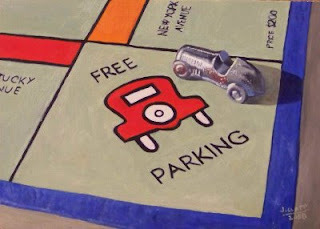 In a Eureka moment, DCMD realised that there was a simple solution to this dilemma. Instead of researching the news, it is much easier to simply make it up. There are many national newspapers which have been doing this for decades. So, without further ado, please change your bookmarks and visit Barnet’s latest entrant to the blogosphere - The Barnet Mash. Never a true word will ever be spoken! 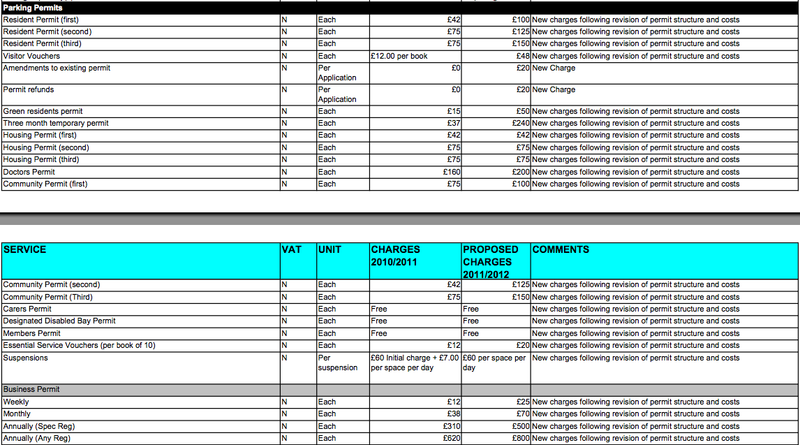 Much has been written in the local press and blogosphere about Barnet’s punitive hike in ‘Pay and Display’ fees and charges (click the table below to enlarge). At the Cabinet Resources Committee meeting on 13th January, Members agreed to increase the cost of Residents’ first permit from £42 to £100 - an inflation busting rise of 138%. The second permit cost will rise from £75 to £125 (up 66%) and for a third permit from £75 to £150 (a nice round 100% increase). Doctors permits will increase from £160 to £200 (up 25%) whilst essential service vouchers go up from £12 for a book of 10 to £20 - a mere 66% rise. That’s right folks. Essential service vouchers go up by 66% whilst councillors continue to park absolutely free of charge. This must be what Lynne Hillan meant when she said that we were all in this together. Reliable sources have informed Don’t Call Me Dave that Conservative Councillor Mark Shooter is to be sacked as Vice Chairman of the Budget and Performance Overview & Scrutiny Committee and also replaced as a member of the Business Management Overview & Scrutiny Sub-Committee. His crime was to insist on referring committee reports back to the Cabinet for further consideration. He had the temerity to suggest that there were better ways of saving public money that those proposed by the Executive. Such is their commitment to democratic accountability, Lynne Hillan and her cronies do not take kindly to having their authority challenged in this way, and Shooter is to be fired. 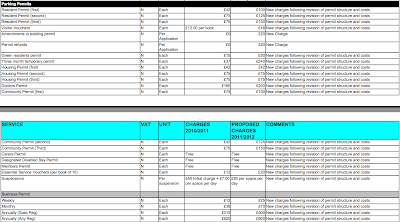 Mark Shooter joined the council in May 2010 and soon discovered that Lynne Hillan is a piss-poor leader who cares only about stuffing her boots at the taxpayers’ expense. Unfortunately, the corrupt system of local government which operates in this Borough, thanks to Tony Blair’s Local Government Act 2000, meant that Hillan was able to survive a no confidence vote by offering highly paid positions to fellow troughers like Andreas and Joanna Tambourgreedy. As regular readers know, former Barnet Council Leader and now MP for Finchley, Mike Freer, could barely disguise his disdain for bloggers whom he suggested masturbated whilst writing about him (he should be so lucky). Brian Coleman’s contempt for blogging led him to become the first serving Mayor in Barnet Council’s history to be found guilty of breaching the Members Code of Conduct following his vitriolic attack on blogger Rog T.
In these continuing times of shame for the political classes, Messrs Freer and Coleman would do well to remember who is the servant and who the master. Left wing blog, Political Scrapbook, has produced a video featuring some of the high profile political bloggers who threw in the towel last year. Missing from this list is one of Don’t Call Me Dave’s favourites, Constantly Furious, which came to an end in June. Iain Dale claims that the reason he stopped blogging is because he’s a media star now darling he has too many other commitments. But DCMD wonders whether we are just observing a shift to localism. If people want national news and opinion, they can obtain it from a wide range of free sources. Good quality local news, however, is much harder to come by. The traditional investigative reporter is fast becoming an icon from a bygone age as local newspapers look to cut costs in the face of falling advertising revenue. The Barnet Blogosphere is currently in good health - with several new blogs appearing in 2010 - providing an invaluable service for the community with an astonishing depth of coverage. The question is, for how long can this continue? If professional newspapers are losing money and cutting back their coverage, how can amateur bloggers provide the same service for free for the long term? DCMD does not profess to know the answer to this question, but fears that local political blogging is unsustainable in its current form. 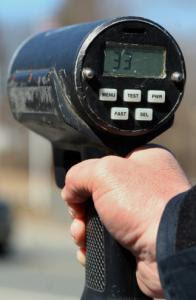 The myth that speeding fines are all about increasing road safety was finally quashed yesterday with the conviction of Michael Thompson whose ‘crime’ was to alert other drivers of a police radar speed trap. Mr Thompson was charged with wilfully obstructing a police officer in the course of her duties. Is it really the duty of the police to catch and fine motorists? Whatever happened to the old axiom that prevention is better than cure? As lawyer David Green writes in his excellent report in the New Statesman, Michael Thompson now has a criminal conviction because he encouraged others to stay within the law. It is time for the Government to stop using the Police Force as uniformed tax collectors and instead let them get on with their job of catching crooks and villains. Former classics teacher and currently Vice Chairman of Ogilvy Advertising, Rory Sutherland makes the daring assertion that a change in perceived value can be just as satisfying as what we consider “real” value. His conclusion has interesting consequences for how we look at life. As shown on Dave over Christmas. 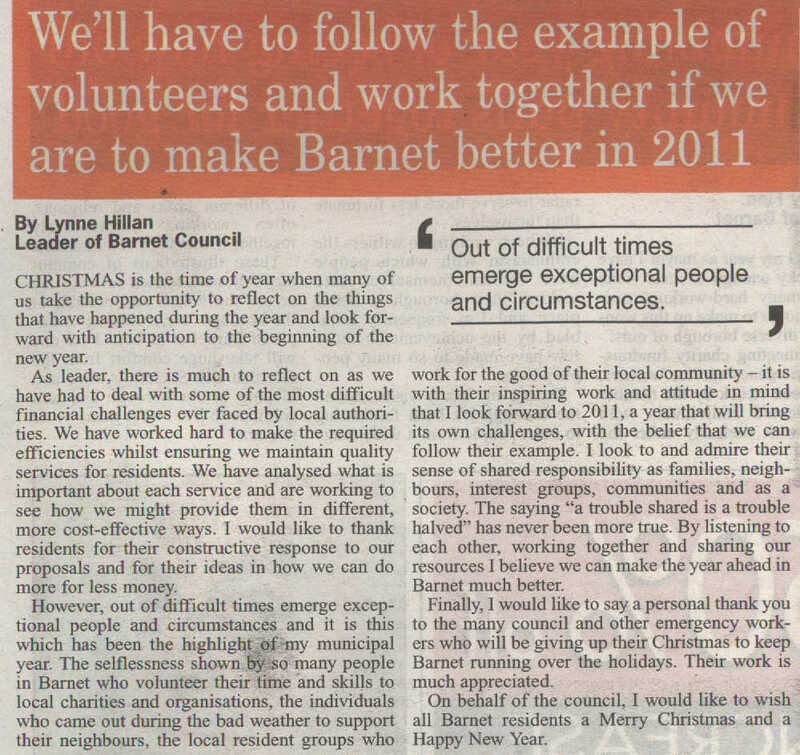 Don’t Call Me Dave was surprised to read Lynne Hillan’s Christmas message to her loyal subjects in the Barnet Press this week, under the heading: ‘We’ll have to follow the example of volunteers and work together if we are to make Barnet better in 2011’. 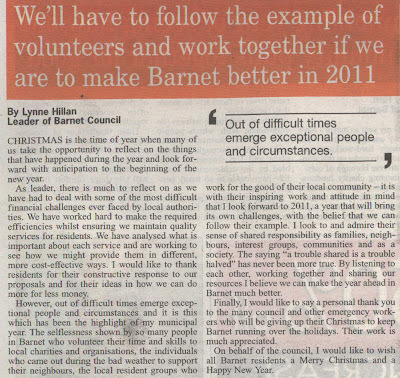 Is this the same Lynne Hillan who, six months ago, tried to award herself a pay increase of £20,000 only to back down after a public campaign led by Barnet’s Bloggers (but not before she had awarded the cronies who kept her in her job an inflation busting increase of 50%)? Don’t Call Me Dave has been shocked at the media reporting of the arrest of his former English teacher Christopher Jefferies on suspicion of murdering architect Joanna Yeates. Murder is the most horrific crime possible and there is a natural public interest in this story, but under our tried and trusted system of justice, suspects are innocent until proven guilty. To date, Mr Jefferies has not even been charged let alone convicted. As the Attorney General has pointed out, there is now a real risk of any trial being prejudiced by this relentless coverage. Whilst we expect the gutter press to dig up as much salacious material as possible, it is regrettable that even the self styled quality papers have decided to follow suit, rather than restrict themselves to factual reporting of the case. Former colleagues and pupils have been quick to lend, or possibly sell, their names for a quote. “He was a bit eccentric” they all say. Well yes he was, but many teachers are. Being eccentric, however, does not make you a murderer. “He dyed his hair blue.” Why is this relevant? “We thought he was gay.” It is true that many of us did think so and perhaps he is but, again, why is this relevant? The Police have not stated whether there was any sexual element to the murder and, even if there was, it would not preclude gay men from suspicion. It is just a rather pathetic effort by lazy journalists to spice up a story rather than deal with the facts. “He was a strict disciplinarian who would lose his temper in class.” Ask any parent prepared to spend £9,000 a term educating their children if they would like it any other way. It is now being reported that Mr Jefferies bought the flat from a teacher of the nearby preparatory school who is currently serving a prison sentence for molesting a child. Well that’s it then. You’ve got him banged to rights. If you buy property from a convicted criminal, you must be a criminal yourself. A huge emphasis has been placed on the fact that Christopher Jefferies once taught at nearby Clifton College. That he retired nine years ago is seemingly irrelevant for a media still fighting a class war. 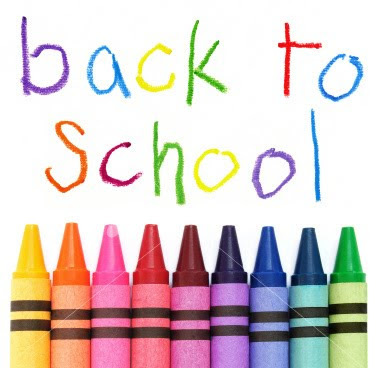 Every opportunity has been used to mention that it is a prestigious English public school. If a long retired teacher from a sink comprehensive was accused of a similar crime, would his former school receive such attention? There is not a scintilla of evidence to link Clifton College to the crime, and it is manifestly unfair to undermine the school in this way and create an atmosphere of fear for parents and pupils. If Christopher Jefferies is charged and convicted of the crime of murder, he will properly face the full force of the law and will deserve no sympathy from anyone, including the media. But until then, a slightly more responsible attitude to reporting would not go amiss.